Critical Infrastructure for Children is a resource for parents, students and educators. The one hundred and sixty-five questions in the book present core information for each of those three groups. 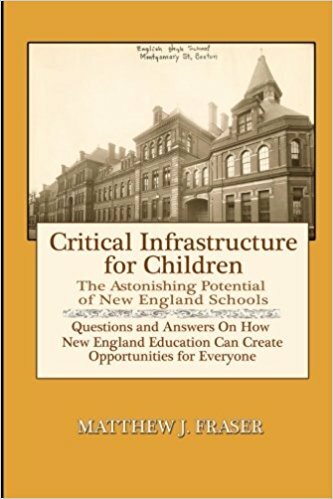 The role of the book is also to facilitate communication between the many groups and people working hard to create bright futures here in New England. You can preview Critical Infrastructure for Children on Amazon with the “See Inside” feature. That quote was not speculation on her part; she was quoting page four of this report. This is one of many reasons why Critical Infrastructure for Children explores multiple tactics to assure we keep these jobs here. If we’re aggressive, smart and work together, maybe we can create our percentage of those two million jobs, or eighty thousand jobs right here in New England. CIC shines a light on some of the great work being done and the subsequent opportunities created, with a shameless focus on how to extend those opportunities to as many New Englanders as possible. Why am I working toward having a modest, fixed annual revenue from book sales instead of trying to get rich? The point of my work is to help as many people as possible, and making too much money would only get in the way of that. Plus, I want people to know that I will be honest about what I promote, and that financial gain is not a primary motive. At a time when it’s hard to find people to trust, I figure that this is the best way to contribute.